Description: CEFX 9395 and sister 9401 lead a grain extra West on the TPW main. How rare is it to catch two SD45T-2's on the same train in 2004! Description: Entered facility with permission. Description: Rear of unit at Remington Hub Center. This unit is usually visible from Interstate 65. Description: I was given full access after I stopped and asked a guy in the office. Lots of detail photos on this one! Description: Loco was just sitting there idling away while I took photos with the family in the truck. Description: My 8 year old daughter wanted me to take a picture of her on the front walkway! Description: Still seems pretty strange to see a 3600 hp. tunnel motor in the middle of Indiana as a switcher! Description: If it weren't for the tiny CEFX patch on the front, this is still SP 9395! Description: TPW heading for P&PU Junction in East Peoria. Description: The TP&W are getting ready to cross the TZPR Illinois River Bridge. 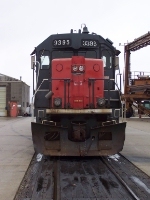 Description: IORY 4011 and CEFX 9395 idle outside the TP&W yard in East Peoria, IL. Description: A westbound TPW freight pauses at Hoosier Lift. Title: A Sight For Sore Eyes? Description: The GALTPW was running late, but who cares he had much better power than last time. Description: CEFX 9395 leads an EB TP&W train at Watseka.